Language: Tongan, primarily, but everyone learns English in school. Population: About 7,750 people, mostly Tongan. About as many pigs. Landscape: Low islands with dense undergrowth, surrounded by long white-sand beaches. Coconut palm and pandanus trees fill the barrier between interior and beach. Visited: Just 2 weeks, from 22 July to 5 Aug, 2004. Notes: The grey areas of the map are reefs, most of which are inaccurately positioned on the charts and difficult to see until you are right on top of them. While reefs are beautiful to dive on, navigation in the Ha'apai is tricky and should only be attempted in good light. Our 2 weeks in the Ha'apai were hampered by the fact that we could only use 1 engine. As we motor-sailed (under spinnaker!) down from the Vava'u Group, Chris cleaned our water-maker pre-filters by tying a rope through them and dragging them in the water behind us. Unfortunately, we all forgot to bring the filters in when we anchored in Ofolanga (top of the map). As we backed down on our anchor to set it properly, the rope with the filters got sucked into our our starboard propeller. We all heard a tremendous bang, followed by the ominous sound of the engine-room bilge-pump coming on. If you're planning to make the seemingly simple passage from Tonga to Fiji, check out our Passage Dangers page. It lists the locations of about 60 uncharted hazards between Tonga and Fiji, as well as a file you can download into MaxSea to automatically plot those hazards. This file also includes safe tracks through the Vava'u and Ha'apai Groups of Tonga. If you're planning to cruise western Fiji, here's another file you can download into MaxSea. It shows some safe tracks through the Mamanuca and Yasawa Islands, as well as additional island and navigational data. When you download either MaxSea User Data file, save it in your MaxSea folder (usually \Program Files\MaxSea or \Program Files\I&M\MaxSea). In MaxSea, click File, Open..., and in the dialog box that appears select User Data as the file type (near the bottom). Select the file you downloaded and the new data should appear. You can modify the data using MaxSea if you want. Selecting File, Close, will remove the displayed data without affecting the chart underneath. The whole engine was jerked sideways. What followed were several "high-adrenalin moments" as Jon worked in the engine-room to find where the water was coming in. 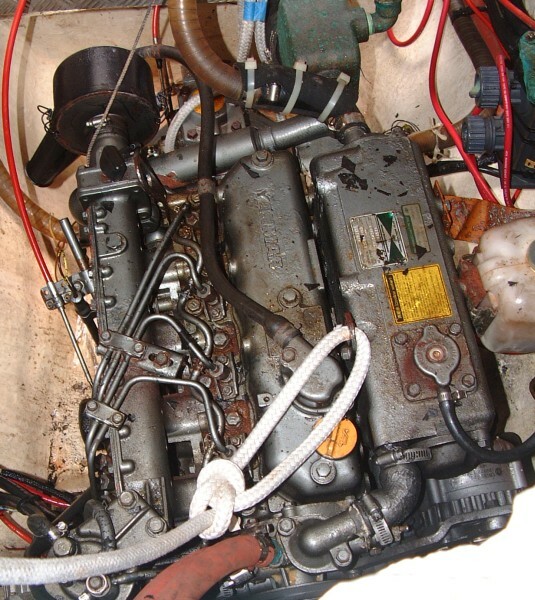 He found 1 broken hose, which was quickly plugged, but the water level in the engine-room kept rising. Reaching through the completely opaque, oily water, Jon felt for the big seal between the hull and our sail-drive "foot" that extends through the bottom of the boat. The main seal had ruptured but the secondary seal had only popped off, so Chris jumped in the ocean and stuffed a towel up around the foot to stem the flow of water. Jon then re-secured the secondary seal. The bilge-pump then drained the water out, but not before most parts of that engine (starter motor, alternator, shutoff solenoid, etc.) had been inundated with oily saltwater, requiring them to be completely stripped and rebuilt. More importantly, all 3 engine mounts had been shredded. Catching the rope in the prop had completely dismounted the engine and we were unable to use it again until we got US$1,000 in parts from NZ (which took a whole month, even harassing them by satellite phone), hauled Ocelot, and replaced the broken components. We were very glad to have a catamaran and carry a "spare" engine. Our broken main water-seal now hangs over the bar in the Mermaid Bar and Grill, one of our favorite hangouts in Neiafu. The shelling was nice, too. Of course, we were there with our good friends on Cookie Cutter, the co-founders of Shellers Anonymous (Mom and I are the others). So where I can walk a stretch of beach and pick up one beautiful shell, they all pick up about a dozen. Okay, maybe half a dozen. But you get the idea. I mainly went along on these little beach-walk excursions to keep my mother out of trouble. 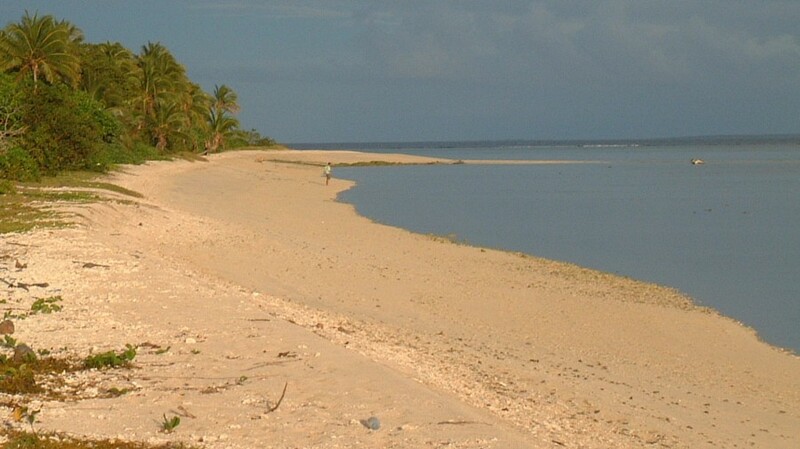 But, of course, all life in the Ha'apai is not of crystal-clear water and beautiful beaches and sunny weather. ... At this point, I was about to launch into a lengthy, blow-by-blow account of the gale we had going from Limu to Ha'afeva, when I scrolled down the page and realized that Dad beat me to it. So as to not become redundant, if you want to hear about the winds switching northerly to southerly and 10 to 40 knots in the blink of an eye, follow my example: take the little scroll bar on the right-hand side of the screen, and pull it all the way down until you see a paragraph starting out "We were in Limu." That'll start you off in the right place! (Chris) I think my greatest regrets touching on the Ha'apai (aside from damaging the engine there) were having so little time (only two weeks) and not using any of that time for scuba diving. The snorkeling was excellent, amazing, and unbelievable! Even where the water visibility was poor, I just loved the reefs, the life, the formations, the variety, the... EVERYTHING (except the sediment impairing visibility). 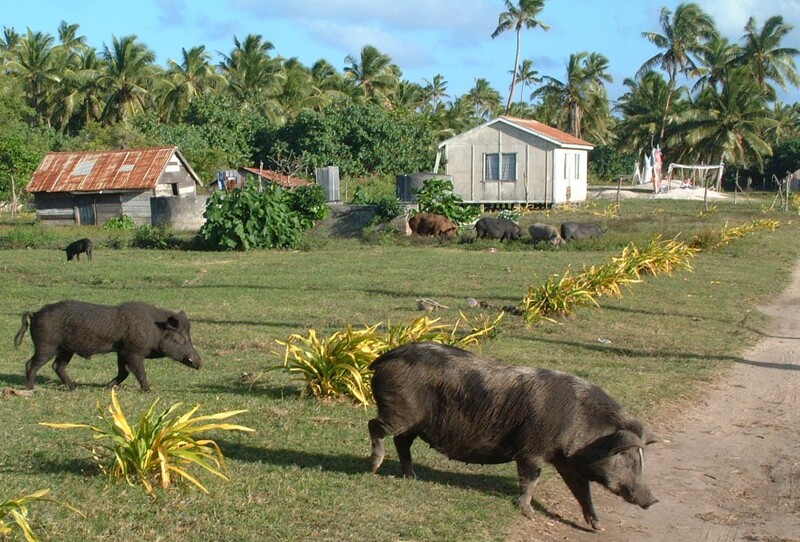 The other great thing about the Ha'apai was all the folks we met. 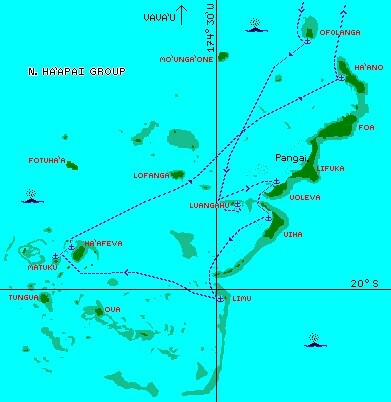 Ha'apai is underpopulated, and few cruisers spend much time in the group (there are few facilities and the anchorages are rarely very good). However, we met several people whom we got to know quite well, and enjoyed afternoons on the (lovely, especially after rocky Vava'u) sandy beaches and social dinner evenings on various boats. Lots of fun! (Sue) Wow. White sand beaches. Long walks around islands. 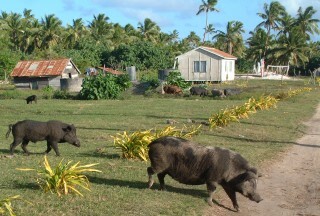 Tiny villages with 200 people and 2,000 pigs (well, maybe I exaggerate a bit). Lots of glorious shelling to be done. The snorkeling was a bit disappointing, though, in that the shallow reefs exhibited the same dead patches as in the Vava'u Group. Where we did find superb snorkeling though was on little Limu Island, in the southeast of our map. 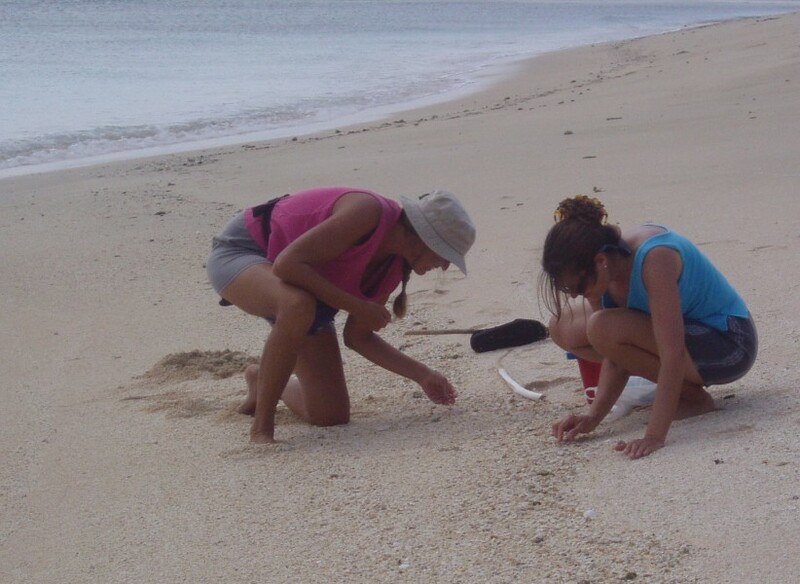 I attribute much of the shallow reef destruction to the long-time custom of the Tongans to walk on the exposed reef at low tide to search for shellfish. (Jon) The Ha'apai were wonderful, with miles of sandy beaches, lots of reefs to explore, whales frolicking everywhere we looked, and good friends around - Bob & Laurie on Shearwater, Canadians Peter & Connie on Cookie Cutter, and Kiwis Murray, Carol, Maddie & Sam on Kiss. But what impressed me about the Ha'apai (as captain, responsible for the safety of boat and crew) was the lack of anchorages with all-around protection. During the 2 weeks we were there, the "Madden-Julian oscillations" were active, and we got 2 "bullet lows". These are small, fast moving low pressure systems that form over Fiji or Tonga and then moved rapidly to the SE. As they moved past us, the wind could come strongly (25+ knots) from any direction, even the west. 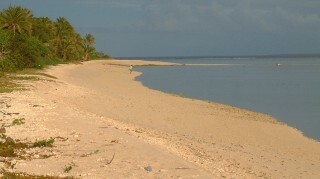 Since the trade winds blow from the east or southeast, very few anchorages in the Ha'apai are protected from west-sector winds. The best we could do was to make sure we were completely encircled by coral, like Luangahu (near the middle of the map). This would have been fine someplace like the Tobago Cays in the Caribbean (where tides are only 1 foot and we anchored in flat water behind the reef in 20+ knots of wind) but tides in Tonga can exceed 3 feet. So even though we were surrounded by coral, there was often 2-3 feet of water over the coral, plenty to make a rough chop. We were in Limu (our southernmost anchorage) with our friends on Cookie Cutter when we heard the next low was coming through, so we quickly set off for Matuku (our westernmost anchorage). We left with a weak breeze from the north, which slowly died away as an ominous black cloud approached from the south. The next thing we knew, the squall slammed into us, with rain and wind howling at 45 knots from the south. Amanda and I had to take 3 reefs in the main and roll up most of the jib, while Chris fought the helm to keep us on course. Visibility was almost nil through the torrential downpour and we were approaching islands with reefs around them. The GPS was almost useless as the charts for the Ha'apai (indeed, all of Tonga) were badly inaccurate. Cookie Cutter tacked and headed out for open ocean until the squall blew over and they had better visibility for their approach, but we thought the radar would tell us where the islands were, and from that we could work out where the reefs were. With Chris on the radar, the rest of us peering through the driving rain, and our one remaining engine straining against the strong winds, we nosed our way carefully around the reefs and anchored in the lee of Matuku. Once Ocelot was secure we went below, closed up the whole cabin to keep it warm, and made up a big pot of hot soup to warm our chilled bones.